Last night was, without question, the most complete defensive effort that we’ve seen out of the Oilers this season. Improved defensive play was seen in almost every player on the ice, which is encouraging given that glaring defensive errors have without a doubt been the Oilers’ biggest problem this season. But you can play the best defensive game of your life, and if you can’t score, you can’t win. Last night against Ryan Miller and the Canucks, the Oilers couldn’t score, and picked up loss number five in a row to start the season, making this the worst franchise start since the 1992-1993 season. Ben Scrivens isn’t entirely wrong. The Oilers looked much better in their own end last night, not losing the puck nearly as often as in previous games, and going after the puck when they did lose it. Edmonton also had a Corsi-For of 58% (per War-On-Ice) and were only outshot 30-28 by Vancouver. Apart from a brief spell in the third period where it felt like Edmonton was never going to stop turning the puck over, at no point did they feel like they were out of the game or that they had given up unlike in Los Angeles or Phoenix. Watching the game last night, I was struck by how improved Nail Yakupov is in his own zone. It felt like every shift I was seeing him get the puck back, cut off the lane of a Canuck shooter, or protect the puck when he was in possession. All of the struggle he went through and all the work he did with Dallas Eakins last season ostensibly had the purpose of making Nail a better defensive player. At the time, I was skeptical, so it’s nice to see (for me and for the Oilers organization) that did in fact pay off. The announcers on the Maples Leafs–Red Wings game last night were discussing Yakupov potentially being a trade piece for Craig MacTavish, but I think that in his case at least, the Oilers are better standing pat. He’s getting better. Hopefully he’ll continue to get better. Taylor Hall, he of the supreme offensive and even more supreme defensive liability, also looked excellent in his own zone last night. It’s no secret that Hall is a workhorse – if will was the only thing that mattered to win games, he’d drag this Oilers team to the Stanley Cup Final on his sheer stubbornness alone. But for a long time, Hall was flashy offense and no substance in his own zone. That wasn’t the case last night. Hall looked strong in his own end, and at one point when Scrivens was sprawling and the Oilers had a wide open net, Hall got his stick on a Sedin shot and saved what would’ve undoubtedly been a goal. Don’t get me wrong. I’m encouraged by all of the smaller improvements we’ve been seeing this season. But the fact of the matter is, you can’t finish a puzzle unless you have all the pieces, and the Oilers do not have all of the pieces to their playoff puzzle. Despite Ben Scrivens posting his best effort of the season, only allowing one goal on 29 shots, the Oilers lost because their forwards couldn’t get any shots past Ryan Miller. 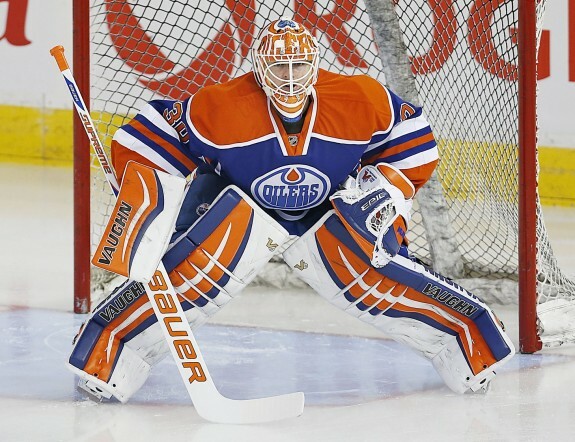 Miller is a terrific goaltender, but there comes a point when you just have to find a way. Another problem thus far has been the decisions of the coaching staff and management. I’m a bit loathe to put this season’s struggle entirely on the players when the team sent Martin Marincin, arguably one of their top two defensemen last season, to Oklahoma City and Dallas Eakins scratched the other of the two, Jeff Petry, to get Darnell Nurse into an NHL game. I understand the need to see your prospects against real NHL players, but you don’t do it by hobbling your blueline. Eakins also went back to the line combinations he’d been using earlier in the season late in the third period, putting Yakupov back with Draisaitl (which has not been an impressive combination) and Nugent-Hopkins back with Hall and Eberle. If you’ve read anything I’ve written before, you know that I’m a big proponent of 4-93-14. That being said, Yakupov and Nugent-Hopkins looked terrific together last night at both ends of the ice, and that’s a combination I think the Oilers should ice more often. All in all, it’s hard to focus on the positives, which do in fact exist, when a team is 0-4-1. If this team doesn’t start winning soon (and potentially even if it does) something drastic is going to happen. The only question is – will Eakins go, or will it be a trade?